When I got my first Mac in the late 80s, the first game I played on it was called "Daleks" and authored by Johan Strandberg in 1984. This simple, but elegant game became a key piece of my own Mac-using history. In 2010, I wanted to go through my old Mac stuff and try to preserve as best I could all the great stuff from that era. The first thing I wanted to do was play Daleks again. Surprisingly, it did run in an emulator, but also had some problems. 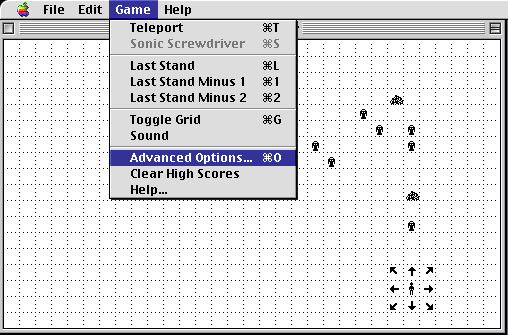 There have been many other Daleks-esque games since then (and even the original was based on the game Robots that ran on old BSD UNIX systems). Most notable of these are The NEW Daleks a.k.a Daleks II by Bob Arning and Classic Daleks by legendary Mac programmer Ingemar Ragnemalm. Unfortunately, both of these fine programs lack the smooth Dalek movement of the original. The original program does not run on some Macs, so I decided to write my own version. High Scores and Preferences are loaded and saved to disk. Identical graphics, animations, and sound to the original. Advanced options for tweaking game rules and settings. Runs on all 68k and PowerPC Macs from the Mac Plus up, from System 3.2 up to 9.2.2. Daleks Forever runs in two modes, fully Strandberg compatible, and Enhanced. In the compatibililty mode, the program is named "Daleks" and tries to look and sound identically to the original Daleks. 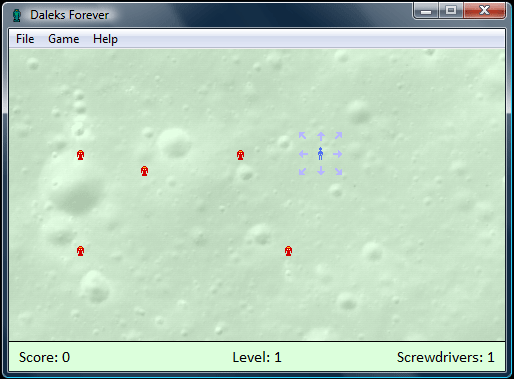 In Enhanced mode, the program is named "Daleks Forever" and has a few changes, including some new menu options and dialog boxes. Sorry, there is also a Windows version. The Windows version is a little more advanced, but you can run it in black and white if your heart desires. An interesting feature is that the global highscores idea would be uncheatable (go ahead, I dare you)! It would work by submitting the game's random seed and move list to the high scores server machine, which would then use a command-line version of the program to run that move list. If the resulting replay showed you had a valid score, your game would be added to the global high score list. This also opens up the idea of 3rd party client programs which could try to use AI to compete with human players; your AI could run through scenarios and submit these move lists to the server. Right now, these move lists are stored in the high scores file of the Windows version, so if I ever get this done, you could potentially go back and re-submit those game results. Well, anyway, I hope there's at least one other person out there who will appreciate this. It's not often that a new program gets released for the Mac Plus these days! 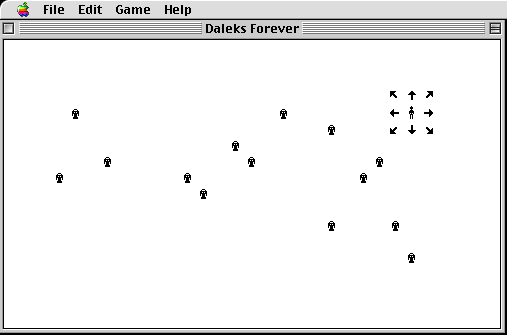 Like the original game, Daleks Forever is free for everyone. Keyboard controls work for moving the player and other functions. In the original game, you needed to use the mouse to click the directional arrows, which gets tiresome. Working animations for the screwdriver and teleport. In the original game, these animations only seem to work on the 8 MHz 68k Macs. Working sound. As far as I can tell, the original's sound only worked on the Mac 128k and 512k. This requires that the Daleks Sounds file be in the same directory as the program. The original's sounds used a tone generator (try deleting its "Tone" resources for better compatibility), and these are digitally sampled from those because I don't know how to get the tone generator to work on all Macs. Copied the Show Grid feature from New Daleks. My version has different grid styles, which can be cycled through using the "g" key or selected from the Game menu. Copied the Last Stand Minus 1 and 2 options from New Daleks. Available using the "1" or "2" key, or via the menu. By default, Daleks move twice as fast during a Last Stand. High Scores are saved with the date and level attained (copied from Classic Daleks). Requires a Mac Plus or better. My version uses the CopyMask function, which is not available in the oldest two Macs. I could work around that, but it would require a lot of extra work. I think that is the only thing left that prevents it running on those machines. A PowerPC native version or Fat binary is available. The Advanced Options screen is available using the "o" key or via the menu. The game will warn you if changes made in the Advanced Options screen make the player ineligible for the High Score list. The directional movement arrows can be turned off. Scrap heaps can be made to smolder, so they appear more like a continually burning pile. (The animation isn't run during Dalek movement, however, which is why I don't like how this option turned out). Teleports can be tuned so they can/cannot land on Daleks, Heaps, or cells next to Daleks. The player can begin a level with a safe zone. This can be helpful so that the player doesn't start immediately next to a hazard. The number of Daleks appearing at the start of a level can be changed. The default is the level number multiplied by 5 to match the original version. You can also begin the level with pre-existing scrap heaps. 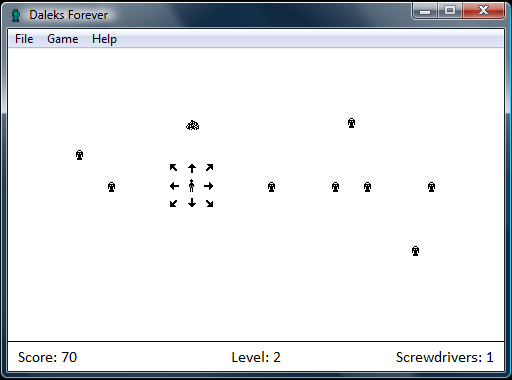 The number of screwdrivers given to the player at the start of the game or each level can be changed. The original game only lets you use it once per level, but using this option, you can let the player have multiple screwdrivers or let them "roll over." Other games often give you one per round, but if you don't use it, you can save it for later. The range of the screwdriver can be increased. The scoring multiplier for killing Daleks with the screwdriver can be changed. In the original version, you get double points for each enemy killed, so if you vaporized 2, you'd get 40 points rather than 20. There is a Last Stand scoring multiplier which can reward players for taking risks. It does not take effect during LS-1 or LS-2, though. There is a multiple kill scoring multiplier available, to give out more points for moves which result in multiple enemy deaths. For example, MKSM was set to 2, and four Daleks died in the same move, rather than 10 + 10 + 10 + 10 = 40 points, they'd get 80. Another tweak available is to set it to a negative number, which denotes a geometric multiplier. If MKSM was -2, they'd get 40 * 2^(nKilled - 1) = 40 * 8 = 320 points. Daleks can be set not to move after using the screwdriver or teleporter. The animation speed can be tweaked. It can be set to "Untimed," which will result in no delays between frames and the fastest possible animation. The original game appears to have a "FreeMem" debug window. My version also has a small debugging window, which can be shown with the "=" key. Thanks for the comments! I was worried that no one saw my post. Cool project! I remember playing a shareware clone of this game on a friends Atari ST computer back in the early 90s. It was so simple and yet so much fun. I will give this one a try! Thank you! Daleks Forever are also available in MVAS (Mini vMac Apps Site) Disk Games #15.